Webster's Dictionary Fourth Edition on USB | OhGizmo! What modern student wants to carry around a real book dictionary? 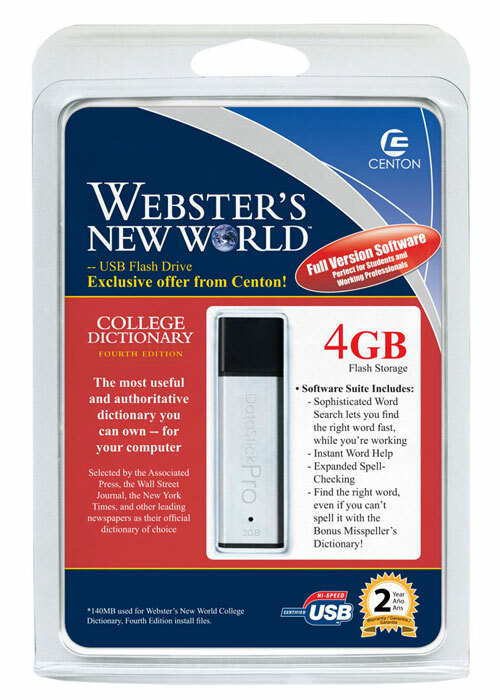 You don’t have to thanks to Centon Electronics thanks to its new fourth edition of the Webster’s New World College dictionary being available on 2GB or 4GB flash drives. One cool feature about the digital version is that the dictionary has a word search function so you don’t have to thumb through pages looking for the word you need. This electronic version is a full version of the dictionary with over 160,000 entries. Also included are an expanded spell check feature and a misspeller’s dictionary to find words even if you misspell them. The 4GB version is available now for $64.99 and the 2GB version sells for $42.99. In my day, we called them software protection dongles.